With the expectation of SNOW this weekend (! ), it’s time to be prepared for weather to come this winter. Salt is very soluble, and it runs off into nearby creeks, rivers, and lakes, where it can have a tremendous effect on native plants. More Than Meets The Eye – Firewood: What to Buy & How to Store. As the weather turns chillier nothing beats a nice, warm, roaring fire. But if you have wood burning fireplace, you’re going to need some firewood! Before picking up the phone, it’s important to know exactly what you want to purchase so that you can clearly express that to the wood seller. This includes determining the quantity, species, and condition of the firewood, all of which affect its price. Homeowners who intend to heat their homes through the use of a wood stove naturally will require more firewood than those who burn only the occasional fire for pleasure. A person who burns firewood as his or her primary heat source, for example, may require up to five cords of wood to get them through the season. In contrast, a weekend-only fire builder can likely get by on as little as a half-cord. For the casual but steady fire builder, one cord of wood should easily last through winter. 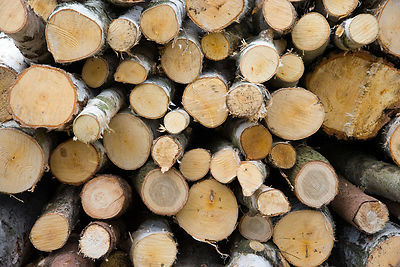 A cord of wood is defined as a stack of cut firewood that measures 4 feet tall by 4 feet wide by 8 feet long, or any other arrangement that equals 128 cubic feet. The individual pieces must be stacked side by side rather than the looser crisscross style. Other measurement terms, such as ricks, racks, face cords and piles, have no legal meaning and are often banned by state weights and measurements agencies. Regardless what the load is called it should always be converted to cords or fractions thereof so that homeowners can determine if they are getting a fair price. It’s a common misconception that burning soft woods, such as pine and cedar, leads to dangerous creosote buildup. As long as the firewood is properly seasoned, it can safely be burned in a fireplace or stove regardless of species. But that doesn’t mean that all wood is created equal. Tree species differ widely in the amount of heat they produce when burned. Hardwoods like oak, maple, and madrone produce almost twice the heat compared with softer woods, such as spruce, pine, and basswood. Fires built with hardwood not only burn hotter, they last longer, meaning the wood pile won’t get depleted as fast. Homeowners can expect to pay a premium for 100% hardwood, but should be cautioned against purchasing cheaper “mixed-wood” loads that may contain little actual hardwood. Homeowners should consider storage long before the firewood delivery truck appears in the driveway. A cord of wood takes up a significant amount of space, and if not properly stored your investment will quickly begin to rot. Firewood that is not stowed in a protected space like a garage or shed needs to be six inches off the ground. Firewood racks or simple pallets work well. If exposed to the elements, the wood pile should be at least partially covered with a waterproof tarp. Experts caution against storing the wood too close to the house for fear of inviting pests.